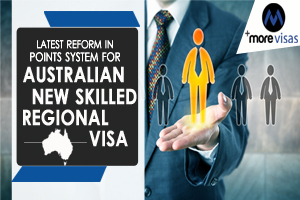 As per the Amendment Regulations of Migration of New Skilled Regional Visas in 2019, 03 new visas have been launched to support regional Australia. The clarifying statement announced by the Citizenship, Immigration, and Multicultural Affairs Minister says, the reforms introduce an improved points system for the Australia subclass 491 visa as well as present General Skilled Migration visas. Points are given for attributes that are associated with the Candidate’s potential to make the most significant economic contribution, as the principal intention of the skilled migration program is to maximize the economic advantages of Australia Immigration. 5 additional points for candidates with a de facto partner or spouse having English proficiency. Migration experts explain the modifications help both singles and those who have a skilled partner or spouse. The new system grants ten additional points for candidates who do not have a partner or spouse. Earlier candidates with partners had the advantage over singles as they can get additional points on their skills of the partner, says Education and Migration Experts. The revisions to the point system attend the advice of the Productivity Commission. The Productivity Commission's 2016 report suggested that the points system be revised so that secondary candidates having skills and other beneficial employment-related features contribute importantly to the primary applicant points score. Priority will be given to the candidates who have a skilled spouse or those who don’t have a spouse. The candidates with a spouse who doesn’t have skills or English proficiency to claim points and will be given rank beneath all others. The latest system will start on 16 Nov 2019.